One way private VIP road transfer from Wellington to Auckland, for 1 to 5 passengers. This is a full day road trip, your driver/guide is legally required to stop for a 30 minute break after 5.5 hours of work time, and we will stop for meal/rest breaks per your wishes. Please let us know your baggage requirements before confirming, we can take 1 large and 1 small bag per person for up to 5 passengers. Return private VIP road transfer from Wellington to Auckland, for 1 to 5 passengers. This is a full day road trip, your driver/guide is legally required to stop for a 30 minute break after 5.5 hours of work time, and we will stop for meal/rest breaks per your wishes. The return trip includes driver cost of living (meals/accommodation) for 2 days/1 night. Client meals and accommodation are not included. One way private VIP road transfer from Wellington to Bay of Plenty, for 1 to 5 passengers. 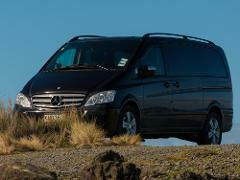 Return private VIP road transfer from Wellington to Bay of Plenty, for 1 to 5 passengers. Return private VIP road transfer from Wellington to Bay of Blenty, for 1 to 5 passengers. One way private VIP road transfer from Wellington to Hawke's Bay, for 1 to 5 passengers. This is a 4 hour road trip, allow at least 5 hours to allow for unexpected delays en route. We will stop for meal/rest breaks per your wishes. Return private VIP road transfer from Wellington to Hawke's Bay, for 1 to 5 passengers. This is a 4 hour road trip, allow at least 5 hours to allow for unexpected delays en route. We will stop for meal/rest breaks per your wishes. Return time is subject to driver's maximum legal hours and overnight stay may incur a surcharge. This is a 5 hour road trip, allow at least 6 hours to allow for unexpected delays en route. We will stop for meal/rest breaks per your wishes. This is a 5 hour road trip, allow at least 6 hours to allow for unexpected delays en route. We will stop for meal/rest breaks per your wishes. Return time is subject to driver's maximum legal hours and overnight stay may incur a surcharge. This is a 6 hour road trip, your driver/guide is legally required to stop for a 30 minute break after 5.5 hours of work time, and we will stop for meal/rest breaks per your wishes.